Too many organizations are overlooking, or even suppressing, their single most powerful source of growth and innovation. And it’s right under their noses. The frontline employees who interact directly with your customers, make your products, and provide your services have unparalleled insights into where problems exist and what improvements and new offerings would have the most impact. But these ideas are rarely listened to or acted on. 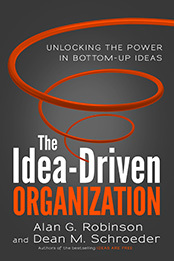 In this follow-up to their bestseller Ideas Are Free, Alan G. Robinson and Dean M. Schroeder show how to align every part of an organization around generating and implementing employee ideas and offer dozens of examples of what a tremendous competitive advantage this can offer. Uses fifteen straightforward questions to help you uncover what drives your boss and use what you’ve learned to take charge of the relationship.